Hello to all my faithful followers and friends, (which should be the same readers). You'll never guess what I did yesterday. 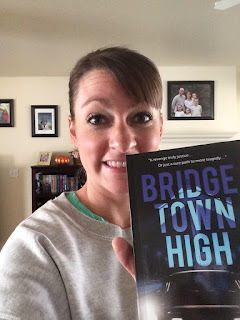 I broke down and ordered three paperback copies of Bridgetown High. They're supposed to arrive tomorrow from Amazon. Do you have your copy yet? If not, why not? It comes in either kindle or paperback. you can go to this page to order your copy and read the reviews. You'll be surprised that it's gotten close to all 5-star ratings and some very kind reviews. If you feel inclined, please write another review. The more reviews (hopefully all good ones) the more likely it will sell and become the best-selling novel it is meant to be (ha ha ha). Also, don't forget to "like" and "Share" this posting. 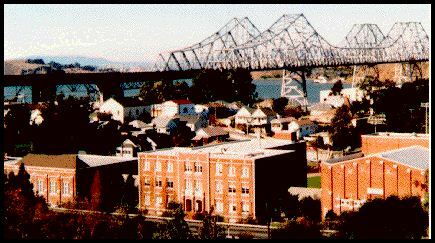 I think I told you on last Monday that I would post a scene in Bridgetown High that I'd discarded. Well, I can't find the one I wanted to use. So, instead I'm going to post an excerpt from the current novel. No spoilers. Just hope you enjoy it. It's a bit bloody, but a turning point in the story. Except for the muted sounds of music from inside the auditorium, the schoolyard felt quiet. Too quiet. The auditorium door shut behind him and the darkness hemmed him in. Looking up, he realized all the schoolyard and parking lot lights were out. Moving toward the parking lot, Mark’s foot crunched some broken glass on the sidewalk. In the dimness, he could make out the base of a broken light bulb in the socket of the light fixture above him. A gust of wind rustled the leaves in the nearby bushes and trees lining the sidewalk. Behind a bush at the end of the sidewalk he thought he saw a shadow move. Mark shivered. Was it his imagination? As he kept moving down the short sidewalk to the parking lot, he heard another rustling sound from behind the bush. This time there had been no breeze. Another shuffling sound stopped him. The hairs on his arms and the back of his neck bristled. The half-moon broke through restless clouds, then hid again. In that moment, he saw and heard another shadowy figure skitter from one bush to the next. Was someone hiding behind that bush? Pop… pop… pop. He heard the sound of cracking knuckles behind him. Mark spun around. Two dark gray shapes emerged from the corner of the building. Stalking toward him. Mark turned back to the parking lot. From behind a bush next to the sidewalk, a third silhouetted figure emerged, blocked his path, and started stalking toward him in the same menacing manner. The only route to the parking lot was through the narrow opening between the bushes and the building. Mark sprinted wide. He had to escape. “Get him, Al!” he heard Jeff call out. That must be the one Genie had called Alan Benaducci, Mark realized. Alan was too quick and stepped in Mark’s path, threatening with a large knife. Before Mark could dodge another way, Jeff and Bobby surrounded him and Alan drew closer. Even in the darkness, Mark could see the crazed look in Alan’s eyes. He looked even more dangerous than Jeff. Mark tried to run and break free from the triangle, but Alan and Bobby grabbed his arms and pulled him off his feet, throwing him down on the grass. Rolling out of their grasp, Mark jumped back up and tried to run again. But Bobby and Alan grabbed him again and held him tight. Jeff shook his head and chuckled. “Now, you lily-livered puke. You’re a dead man.” He slugged Mark’s stomach, knocking his breath out, then a slug to his face stung and spun his head to one side. “Come on, you chicken, fight me,” Jeff said, then spit in Mark’s face again. The sick ooze made Mark nauseous. In spite of being held tight by Bobby and Alan. Mark leaned his head to wipe his face on his suit jacket sleeve. It was useless to fight against three of them. “Kill me? Ha! That’s funny!” Jeff laughed. “Me? Kill your family? Now that’s an idea. What’s the matter, worm? You afraid you’re gonna get hurt? I think you’re just chicken to fight me. You gonna run home and cry to your dead mommy? Or should I say mummy?” Jeff belly laughed. The jab about his mother stung again. Not only had Jeff killed his family, now he had to gall to rub it in. He wanted to kill Jeff for that remark and he struggled to break free so he could slug Jeff, but Alan and Bobby held him too tight. “Tell them to let me go. I’ll show you who’s chicken.” He put up his arms to fight in spite of being held tight. Then, Jeff slugged Mark hard in the pit of his stomach. Buckling over, he nearly blacked out, gasping for breath. Propped up by Bobby and Alan, Jeff threw an uppercut that slammed into Mark’s wet face. Bobby and Alan tried to push him to the ground again, but he staggered to keep his balance. He was sure Jeff had broken his nose with that last blow, and probably knocked a tooth loose too. He could taste the coppery taste of his warm blood, and felt it dripping off his chin as he gasped for air. Mark struggled to dodge the blows. He swung his arms and lowered his head to try to block them. A high kick slammed into his left eye, shutting it. Bobby and Alan finally let him go, but before Mark could escape, a hard kick to his groin doubled him up in unbelievable spasms of pain. His head struck hard on the sidewalk as he fell. Rolling back onto the soft grass he attempted to escape his tormentors, but another kick slammed into his face, shutting his other eye. He tasted the sweet grass, mixed with dirt and blood. They were going to kill him. God, help me! It was the first prayer he’d said since his family’s death. Mark couldn’t tell who was hitting him any longer. Every blow added a new layer of pain and agony. “Should I finish him?” Alan laughed. “No! Not your knife,” he heard someone else shout. It sounded like Bobby, but it didn’t matter. Another hard kick to his groin and another to his ribs knocked more wind out of him and crashed additional pain through his already contorted body. Another kick to his head and he saw stars. Now, Mark was only vaguely aware of the kicks. The blows to his back. To his head, his stomach, and again his groin. Stiffly, he tried to curl tighter into a ball and covered his head with his hands and arms. Another kick crashed against the side of his head. A bright light flashed in his head. 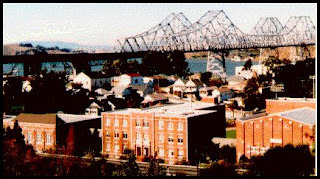 Suddenly he was on the bridge, in his family’s sedan. His mother, father, Sabrina and Amy. Then a car passed. Red taillights. Was it Jeff’s? The car hit his car. His dad over corrected. The gasoline truck bore down on them. The family car toppled. An explosion. He saw Amy on the pavement covered with blood. It all happened in an instant. Then he heard a girl scream and another blow to his head turned everything mercifully black. Hello again to all my faithful followers and friends. It looks like there are a lot of you out there who would love to be a writer, especially a published writer, or in other works, an author. That's the definition of published writer -- an author. I can see by the number of visits my last post generated that my following is growing. That's important for a writer, especially since that could generate sales. I've probably said this before, but for a author, the more "Likes" you get the higher can be your rank on Amazon, and the higher your rank, the more likely you'll get sales. Likewise, the more "Shares" you get the the more exposure you will get, as every time someone "Shares" your work it can get exposed to everyone on that person's time-line on Facebook, especially if you share it with the "Public." There's something else that's important, and that's reviews. I read somewhere that for an author to be successful, he/she should get at least 25 reviews -- the more the better. So far, I've gotten only 9 or 10. Howdy. Finished your novel and the review is up on Goodreads. This is your first novel? Holy damn, I was impressed!! I hope you'll enjoy this review. Thanks for following me. It's exciting to see my book gaining in popularity, and it's a lot because of you. 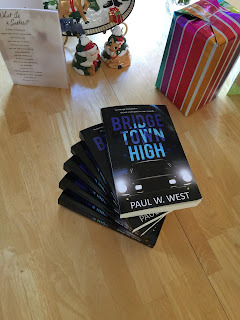 So, after reading my last post, especially the part where it took me 30 years to get "Bridgetown High" published, do you still want to be an author? It ain't easy, but as you write, if you truly want to be published, it becomes a passion that you just can't get over. While most people don't have it so rough as me, I write this to encourage you, my faithful followers, to not give up, not matter how difficult it seems. I mean, if I can do this, you can too. I was fortunate, after several years of working on it, to finally find a critique group on line that helped me greatly. Over those years, I couldn't decide on a title. I started with "Mark and Genie's story," went on with "The Bridge Beckons," even tried "Bridgetown High," but tossed them all. Did I say, tossed them all? 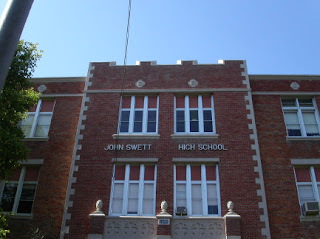 Even "Bridgetown High?" Yup. But as I kept trying different titles, "Bridgetown High" kept resonating with me. I asked my critique group their opinion and they liked it too. Well, I told myself, I'll go with it, knowing a publisher would change it any way. So, began the arduous task of sending out query letters to agents. I tried to send out at least 5 queries a week, but rarely did that many. Years passed -- only got rejections. I don't have an actual count, probably sent out more than 200, maybe more than 300 query letters. Most agents never responded. Those that did, just said things like, "Not for me." I considered self publishing it, but that idea scared me. Maybe it won't scare you, but I knew I didn't have the money for professional editing, cover design, and time to market it. Then a high school friend of mine read some of my Facebook musings and gave me a referral to a published friend of hers, Theresa Messenger (don't know if I spelled that right or not). I contacted her and found out she is published through Limitless Publishing and agreed to let me use her name in contacting her publisher about my book. It was a long shot at best, but you know the adage, "Nothing ventured, nothing gained." They accepted it!!! And they kept my title! I was shocked. A real publisher accepted it. They even did the necessary editing and made up the cover design. So, after signing the contracts, they even did a lot of the first blush marketing for me. That was great. I still have to do a lot, if not most, of the marketing, but I'm learning how and that's becoming a big help. P.S. Please don't forget to "Like" and "Share" this post to all your "Friends" in Facebook, and "Re-Tweet" it to your friends in Twitter too. BTW, don't miss future posts. Let me email them directly to your email. Add you email address to the "Subscribe" box on the side bar.